This volume details reviews and protocols on the development and analysis of both cellular and animal-based pre-clinical models in a number of medical areas, including metabolic disorders, longevity, cancer, heart disease and psychiatric disorders. Written in the highly successful Methods in Molecular Biology series format, chapters include introductions to their respective topics, lists of the necessary materials and reagents, step-by-step, readily reproducible laboratory protocols, and tips on troubleshooting and avoiding known pitfalls. 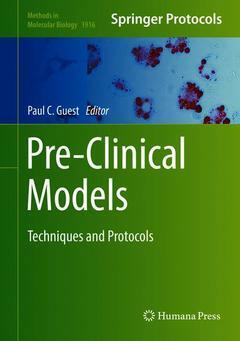 Authoritative and cutting-edge, Pre-Clinical Models: Techniques and Protocols aims to provide methods that describe the context of specific disease or therapeutic areas.